View down Franklin Street one afternoon last week. View other Skywatch Friday pictures. Wonderful light and curves and shapes. A warm, golden light of september..
Glad to see you had a great afternoon, fabulous sunset and perspective! This is just a fine angle to shoot these buildings... and strong lighting. Seen it often! This light is so transformative. It softens the lines of these buildings, turns archecture into art. Wonderful capture. The light and the angles are wonderful. Gorgeous - glad you weren't tempted to straighten the buildings up - it looks more effective as it is. I Love being in Boston ! I need to get back there. The buildings, the history, just so beautiful! Very nice . . . it is all about the light and having a camera with you to capture it. Beautiful city shot. That's quite stunning. Serendipity? Right place at the right time? Fabulous view of the skyline, the light does make for a interesting feature. great shots, top to bottom! between the Memory and the Dream. 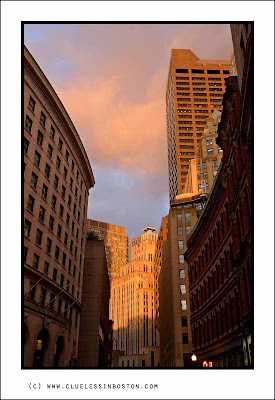 Boston looks like a great place and you are a wonderful photographer. You caught the best of Fall Sunset colors. What colours! What impressively massive buildings! I came to look at your monochrome picture but this one leapt out at me with it's wonderful colours instead! now that's a SKYWATCH & Skyline watch!